of duck, swan, and snow goose. meals, and lodging. One trophy and two does. use of dogs. Truly a great experience! Great guides and awesome places to hunt. Growing up as a farmer's son you acquire a love of the outdoors real fast. You learn to be a good steward of the land and the wildlife that roams freely among it. But we all know that management of wildlife is important. This is what has led me for years to teach and help others learn about proper wildlife management. It is a passion of mine to take kids that do not grow up in a setting where you experience turkeys in your backyard, deer feeding in the fields, baby rabbits nested in your flowerbeds, or listening to quail and dove. Hunting in Virginia is more than a hunt. We have a lot more to offer than just the hunt. The beautiful scenery of the farmland. Along rivers and swamps the big bucks sightings really heat up during the rut at the end of October and into November. Listening to the ducks, geese, and swans migrating down from the North is music to the ears in the early morning. Moncuin Creek history runs deep. It began with Indians that lived on the Pamunkey River. 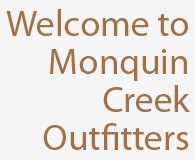 Moncuin Creek is located on the Pamunkey River and has several miles of river frontage. We offer many different types of hunts, fishing, and outdoor adventures. There are hunts offered on the river as well as in marshland. Some walkways are wheelchair accessible. Please visit our North Carolina Hunting Guide and Virginia Hunting Guide Service pages below for more information on waterfowl, deer, and turkey hunting.